The slim external drive comes with two of Intel's upcoming 510 Series solid-state drives in a RAID 0 configuration for a total 500GB of storage. Two ports are found on the rear, which can be used to daisy chain with other Thunderbolt-enabled devices such as a display or additional storage device without a loss of performance. 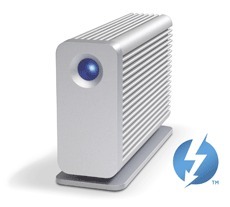 LaCie isn't quoting speeds at this point but says the Little Big Disk can deliver multiple streams of HD video plus hours of content in just minutes over Thunderbolt. It will be available by this summer although so far no pricing or exact date has been revealed. Meanwhile, Promise announced a high-speed RAID storage solution dubbed Pegasus, which can reportedly deliver 800MB/s of throughput. It comes in both 4-bay and 6-bay versions with a brushed ally enclosure holding up to 12TB of data and can also be daisy-chained with up to six other peripherals. Code-named Light Peak, the current copper-based generation of Thunderbolt can transmit both raw data and audio-video information simultaneously with 10Gbps speeds between computers and devices. Future iterations are expected to move from copper wire to a fiber-optic connection, which Intel has said could eventually allow for speeds up to 100Gbps. It remains to be seen how well the market responds to the new interconnect, however. For now, only Apple has embraced the technology, but other PC makers are expected to adopt it later this year and into early 2012.